Please delete first post – I hit a wrong ???? What an inspiring post! I read Christy’s a day ago with tears in my eyes (my faucet has been turned on 66 years). I felt so bad for her, but what faith and a positive attitude she has. Easy to see where this came from. Please just know Bill and I are praying for all of you. God Bless You! The supernatural evil thought it had the upper hand, but this is clearly a true modern day story that God triumphs evil and you listened to make the best of every opportunity for His glory. I am so sorry for all of you and your pain, but God is good, and He knows He has a plan for you. The tears are a good thing. Whether sad or happy, they cleanse the soul to give us perspective and a goal, a goal that God has for you. I am thankful for our God. He will see you through this and your bodies healing. Thank you for listening to his commandment, even though you were weary. God Bless you and your family, and will continue to uplift you in prayer for full recovery of your injuries. Praising God for his protection of ya’ll. . Awed by his presence in the dailiness of our lives and choices. Anxious to see the continued revelaton of his hand through your lives. choices, and obedience! Inspired….AGAIN…..by you and your most precious family. You guys are some of my all time favorites…..and this post is why…..the people you are. Regular, normal people chasing hard after an amazing God….loving people, even as you are suffering and obeying even when it is not easy. Amazing! I love Christ in you (all of you guys) AND one of my favorite things from Christy’s blog is how Scott and Tucker wept and prayed over ya’ll. What joy you both must have seeing ALL your children walking with the Lord! Thank you, thank you, thank you! Shay and Linda, I echo Princess and all the statements of love and support. We Sparks are loving you and praying from a distance. I also know that darkness and evil exist. AND that the supernatural could affect Taxis just as much as scooters. It’s all grace, friend. I, too, see the supernatural at work, redeeming and bring beauty out of difficulty through you and your family. Well Shay…your tears are contagious, I’m also sad for many of the same reasons but my heart is so full of joy that you guys are home and all of you are on the road to recovery. It will be a little longer road for Linda physically but there are many helping hands just waiting for a call to action. It would have surprised me if you had responded any other way than you have… the brokeness, the obedience, the soul searching but I can’t help but to feel that this time of reflection is what will make you strong in the end. However, I can also hear everyone saying don’t be soooo hard on Shay!!! Yes, you were in the drivers seat but it is the adventureous nature in you that we all love. My biggest prayer for you has been and will continue to be that of emotional healing because I think that is were your biggest wounds are. God has already opened wide the door of opportunities and He has and will continue to find you faithful. Being vunerable and transparent is often the hardest part of getting through these valley experiences. Shay what may have been meant for evil God can and will use for good… Genesis 50:20 As for you, you meant evil against me, but God meant it for good, to bring it about that many people should be kept alive, as they are today. As many others I’m anxious and excited to see how God’s Glory is revealed in all of this! Tears are good things. Lots of tears were shed here as we prayed for you and waited for your safe return! Sad Tears, Glad Tears, Good Tears. Your “adventure” served to be a great testimony to many and I’m praying that you will one day see how God fit it all together. Shay, your entire family has been in my prayers since I first got word about the accident. 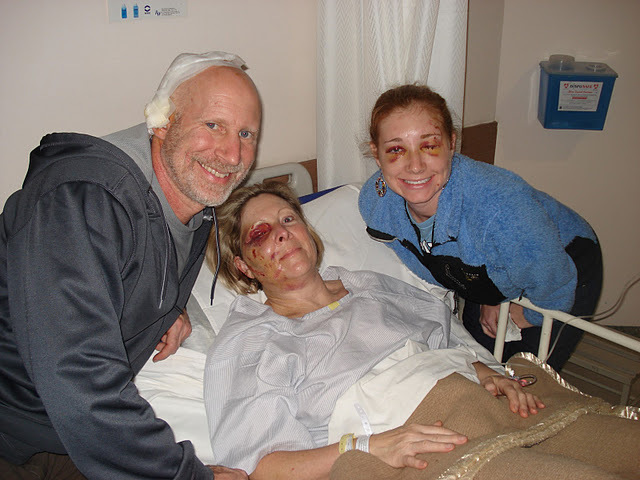 Christy’s blog post with the details was very sobering and I am rejoicing over the Lord’s protection of you all. I am praying for you (all) as you heal physically and emotionally. Not only did my heart hurt for you, Linda and Christy’s physical pain, but also for Chad and your son’s emotional turmoil of having to witness their loved ones enduring so much. I don’t put a lot of stock in dreams, but last night I dreamed about you and Linda, so I felt like maybe the Holy Spirit was prompting me to reach out and encourage you two. Thank you for investing in me as a teen. Eternal rewards, my friend.